If you’re interested in getting into building your own web sites and apps, this is the best way to get started. 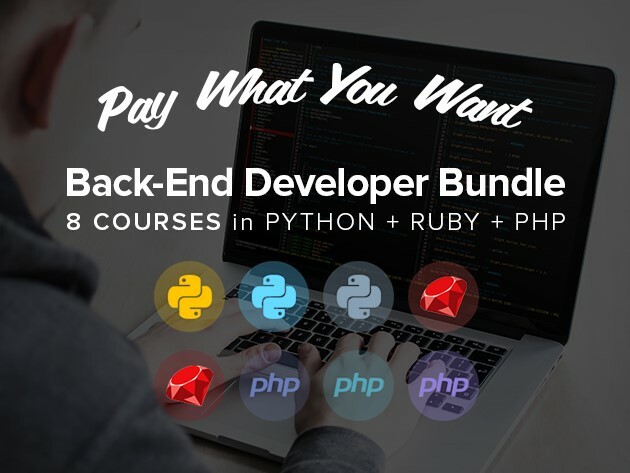 The Back-End Developer Bundle includes a range of courses to teach you Ruby, Python and PHP at your own pace, and at your own price! With over 95 hours of training content, these eight courses take you through the basics with no programming experience necessary, and help you hone your coding skills from there. When you’ve completed all the courses in this bundle, you’ll be able to write clean, efficient code and work on real projects. Ready to dive in? For any price over $1, you get the Python for Beginners and Ruby for Beginners courses, and you just have to beat the average price to unlock all eight courses! Plus, 10 percent of your purchase will be donated to the charity of your choice: choose from Child’s Play, World Wildlife Fund or Creative Commons. Name your price and make your way through the Back-End Developer Bundle today.